The tree stamp, from Personal Impressions, Winter Birds-Tall Trees, just asked to be made into a card for the November challenge, so I just had to buy it. 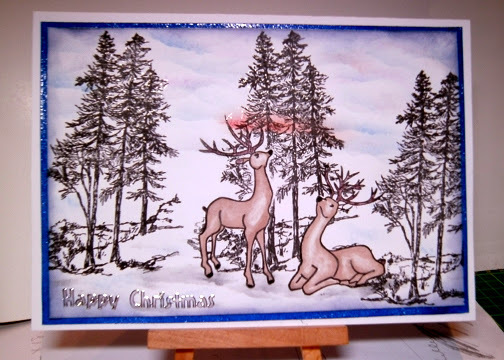 I paired it up with two of Clarity Reindeer stamps, which I stamped onto the card first. I covered the deer with masks and then stamped the trees three times. After colouring the deer using Promarkers I used Adirondack inks and torn paper with a sponge to create the sky and the snowy foreground and then added a little sparkle to the trees using a Clear Star Gelly Roll pen, before layering onto a piece of card which I had embossed around the edges using Versamark and Heat it Up embossing powder in blue. And here is her lovely card! 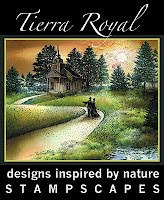 I will be back on Sunday with winners of the trees challenge and our theme for December. and you made the sky very good. beautiful done! I really like this scene.